The PD3000 is widely known as the market leading pole display for PC-based POS systems. It has long set the standard for reliability, value and functionality – reasons why most end users and value-added resellers ask for it and other Logic Controls pole displays by name. One of the reasons why the PD3000 is the leading pole display is its well deserved reputation as the most reliable offering on the market. The PD3000 uses special display technology and unique circuit design to achieve this reliability. 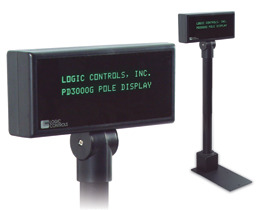 The PD3800 universal pole display provides support for almost any command set or language. The unit supports the Logic Controls command set and OPOS and JPOS drivers, but it can also be programmed to support command sets from Epson, Partner Tech, Ultimate Technologies, IEE, EMAX, Aedex, or Noritake. In addition, updated or new command sets can be downloaded into the display at any time after purchase. Many different languages are also supported- from common languages like English, Spanish, German, and French to less common languages like Norwegian and Slavonic. Importantly, these command sets and languages are selected through a software interface. The use of dip switches or other hardware-based selection mechanisms, which inherently decrease the reliability of the hardware but are still used by our competitors, is avoided. The PD3000 comes with much functionality that simply is not found in other vendors’ pole displays. “Smart scrolling,” user-definable characters, and a built-in real-time clock are all standard features of the unit’s firmware. The PD3000 is also more visible than its competitors due to a special scratch-resistant lens that has a color optically matched to the light emitted from the vacuum fluorescent display. Like all Logic Controls customer display models, the PD3000 also provides comprehensive and innovative support of different interfaces. Logic Controls was the first to offer port-powered customer displays that use a standard USB port. Models with serial, USB, USB port-powered, parallel and serial or parallel pass-thru interfaces are available.